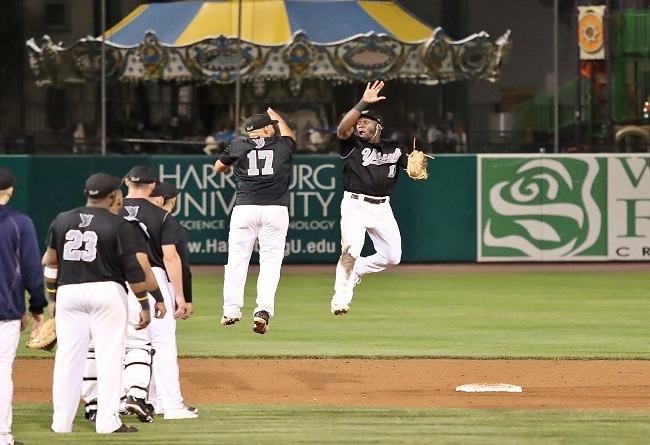 (York, Pa., Sept. 21, 2017) - The York Revolution defeated the Southern Maryland Blue Crabs in Game Two of the Freedom Division Championship Series, 7-2 on Thursday night in front of 4,027 fans at PeoplesBank Park, powered by home runs from Telvin Nash, Alonzo Harris, and Chase Simpson. The Revs take a 2-0 lead in the best-of-five series, and head to Waldorf, MD on Friday with a chance to sweep. The Blue Crabs grabbed the early lead in the first. Jose Lozada led off the game with a home run down the right field line off of Victor Mateo for a 1-0 lead. It was the second time this season that Lozada led off a game against the Revs with a long ball. Two batters later, L.J. Hoes continued the inning with a walk, and advanced to second on a single from Michael Snyder. Later in the inning, Cory Vaughn delivered a bloop RBI double down the right field line, to put Southern Maryland ahead 2-0. Mateo got in and out of trouble in the third. Nate Samson led off the inning with a shot off the right edge of the Arch Nemesis in left, narrowly missing a home run as he settled for a double. Hoes tried to bunt him to third but Mateo pounced on the bunt and caught Samson in a rundown for the first out. Later in the inning, Devon Rodriguez smoked a single off of Nash’s glove at first. Second baseman Rubi Silva nearly recovered to record the out at first, but handcuffed Nash on the throw, and Hoes advanced to third. Mateo escaped further trouble with a fielder’s choice, however, maintaining the deficit at two. The Revs jumped on the board in the third. Simpson laced a single to right center to lead off the frame, and with two away, Silva also singled to center. Nash followed, and for the second time in as many nights, connected on a home run, launching a three-run shot to deep left center to give the Revs a 3-2 lead. The Revs took Blue Crabs starter Daryl Thompson deep again in the fourth as Harris belted a solo shot over the Arch Nemesis to extend the lead to 4-2. The Revs held the two run advantage through the middle innings. Michael Click took over for Mateo midway through the sixth, recording the final two outs of the inning and stranding a runner at second base. Joe Van Meter worked a scoreless seventh inning for the second consecutive night, and Ricardo Gomez came on to get the first two outs in the eighth. With a runner aboard, Revs manager Mark Mason turned it over to closer Chase Huchingson who recorded the final out of the inning on a grounder to first. The Revs put the game away in the home eighth against Evan Reed, after handing the righty a loss on a walk-off home run to Nash the night before. Isaias Tejeda led off the inning with a rocket through the left side for a single. Two batters later, Ryan Dent slapped an opposite field single to right. That set the table for Simpson who jacked an opposite field three-run homer to left center, busting the game open as the Revs led 7-2. It was the fifth home run for Simpson in his last ten games played. Huchingson returned to the mound for the ninth, and after giving up a walk and a single to begin the inning, set down the next three Southern Maryland hitters to finish off the win. The Revs and Crabs meet for Game Three on Friday night at Regency Furniture Stadium. York sends lefty Frank Gailey (14-9, 4.26) to the mound to face off with Blue Crab righty Brian Grening (9-8, 3.91) at 6:35 p.m. Darrell Henry and Matt Present will be on the air at 6:15 p.m. on SportsRadio 1350 WOYK as well as online at woyk1350.com, and on the WOYK App.